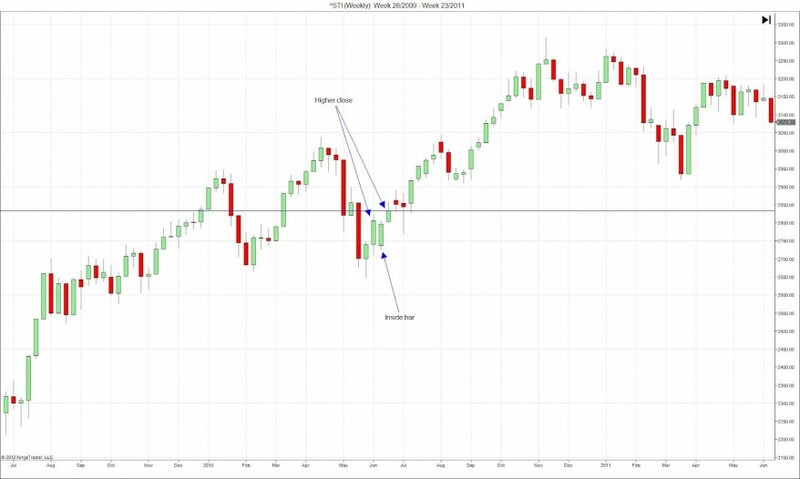 Johnan Prathap introduced the three-bar inside bar pattern in the March 2012 issue of Technical Analysis of Stocks and Commodities. Essentially, this trading setup enhances the standard inside bar break-out trade by adding a trend context and a follow-through confirmation. This is a weekly chart of the Straits Times Index, the barometer of the Singapore Stock Exchange. It shows a higher close followed by an inside bar pattern. The inside bar then broke out upwards before ending with a higher close. We made a long entry the second higher close. The blue horizontal line marks out entry price. After our entry, prices continued its upward trend. Look at the two long bearish bars in the swing down before our setup. They show that the market made two serious attempts to go lower. However, price found support at the previous swing low and formed a bullish reversal bar just before our setup. This context was great for long positions. Moreover, the inside bar gapped down before trading up to finish the day as a bullish bar. That was as bullish as an inside bar could get. It was an excellent long trade. This is a daily chart of Vanguard REIT Index ETF listed on the NYSE. It shows a bullish inside bar pattern after a lower bar close. The lower close completed the short trading setup so we went short at the close of the day. The trade went against us on the next day and proceeded to take out the high of this pattern, where we normally place our stop. As this was a short setup, the downward trend was to our advantage. Although this pullback up was complex and retraced more than previous pullbacks, the trend was still pointing down. Hence, looking for shorts was reasonable. However, the bullish inside bar was a warning to us. Look at the two bars before and after the inside bar. It was clear that some choppy trading was going on and whipsaws might follow. This trade could have been profitable if we had used a wider stop, like a volatility stop instead of a pattern stop. The three-bar inside bar pattern modified conventional inside bar trade and made it more useful. It is impressive as it joined three trading concepts. Making sure that the trend is your friend with the first higher close. 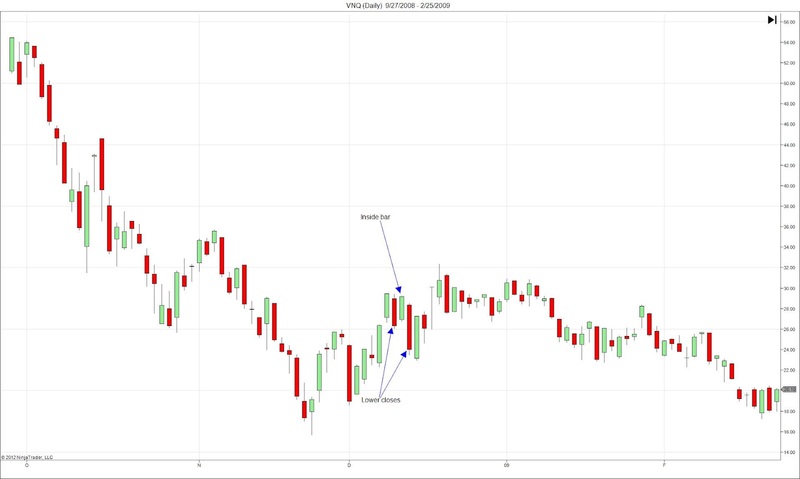 Finding a pullback and decreased volatility with the inside bar. Confirming the breakout with the last higher close. This trade setup serves to illuminate these three concepts. 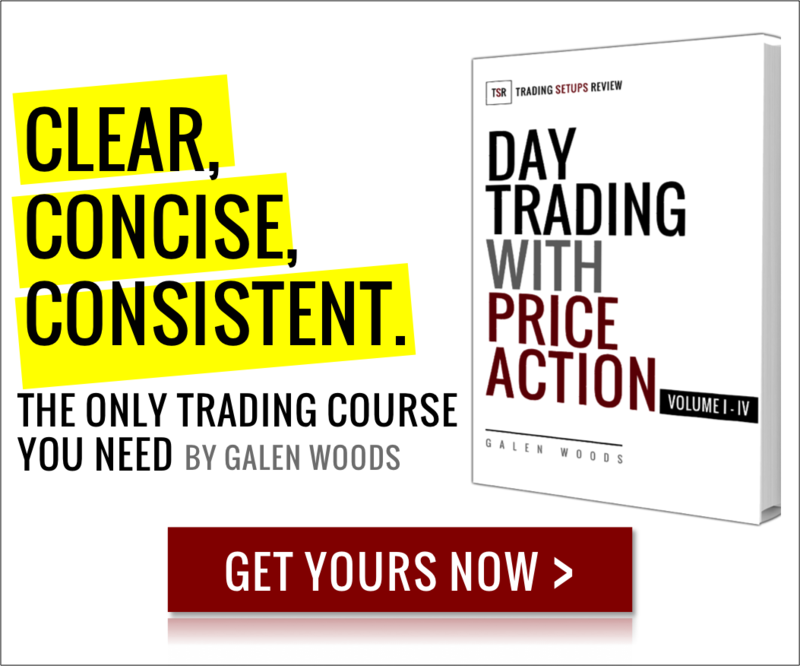 These ideas are beneficial not just for this setup, but for assessing any trading strategy. This is a sound trading setup. Pay attention to the inside bar. A bullish inside bar is better for a long setup, and a bearish one is better for a short setup. What if the inside bar fails? Great work. Is there any plan to write AFL codes for these patterns? Hi Rajesh, I’m not familiar with AFL. But I found this link which might be useful for you. Click here.